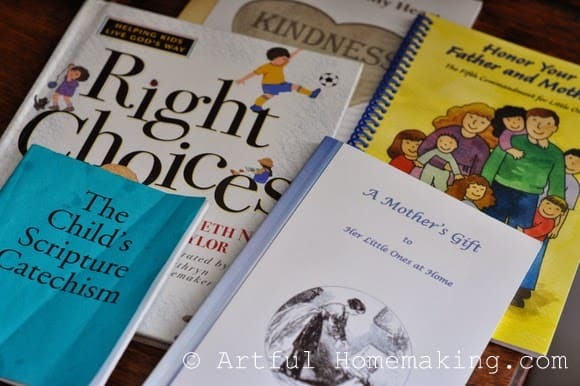 I first came across the idea of Circle Time from Kendra at Preschoolers and Peace. I liked the idea of having a time to focus on the most important things first. At least, that’s what Circle Time is for us. It’s a time to focus on memorizing Bible verses and poems, singing together and hymn study, prayer, character building, and much more. 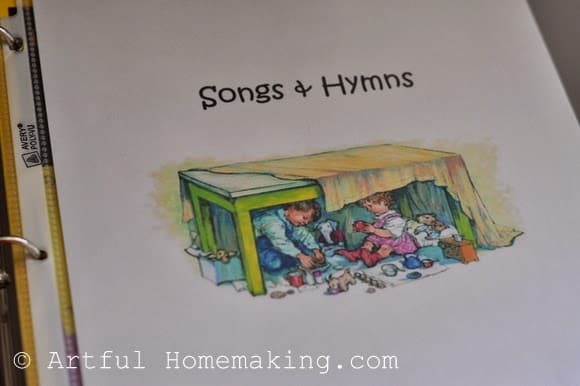 Behind the “Songs and Hymns” divider, I have the songs we plan to learn /memorize. Do you plan a Circle Time into your school day? I just love this post! I subscribe to your blog and when this came to my inbox it was like a breath of fresh air. I created a binder similar to yours and this is my favorite time of our day together. Thank you so much for sharing. I like the Storytime with the Miller's series. It's very Mennonite, and we are not but the books are good. I do have a question though– We really have trouble getting back into the swing of things after summer. We talk about doing some school, but with trips, swim class and other stuff, we just don't get there in the summer. My children balk at Bible time, and think it's boring. They are good at fussing. I don't want them to hate Scripture, but it's important, so is there a balance? I have one friend who every evening they listened to the KJV on CD for an hour every night. They all hated it. 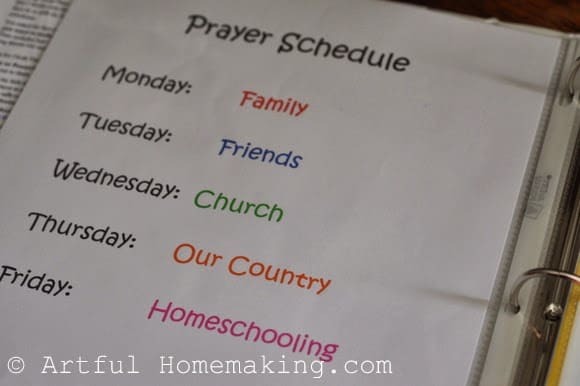 She loves the Lord, thankfully, but isn't repeating that method with her children. I know it's hard to do school in the summer–it is such a busy time. I didn't do much this summer either. Regarding Bible time, I'm not an expert, but I'll offer a few thoughts. I think keeping it short is a good idea. We don't have Bible time for a long period of time. It's very brief. It's just a way for us to focus on what's most important first thing in the morning. My plan right now is just to go over Bible memory verses, learn new ones, and maybe have a short character study time. 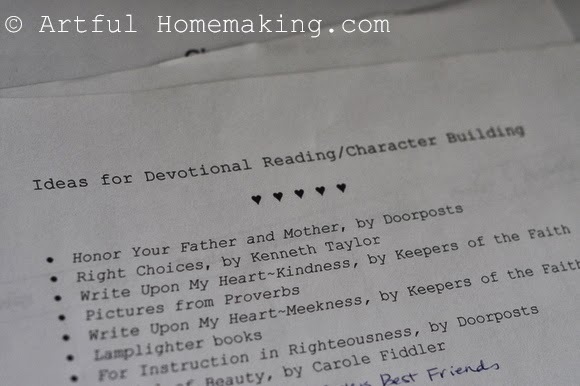 When I saw your comment, I asked my two daughters, age 14 and 12, what they thought about our Bible time. I said, "Do you like memorizing Scripture?" They both said they did. They said they thought it was important, and something worth doing. I asked them if they liked Bible stories, and they both said they despise silly stories and prefer just the facts–what's in the Bible. I asked them how they would like to be required to listen to the KJV on CD for an hour every night, and they both looked concerned, like I might be going to suggest that! Needless to say, they both thought that wouldn't be pleasant! The interesting thing is that when I became a Christian at the age of 16, I couldn't get enough of the Bible. I read it straight through in 3 months. And when I wasn't reading it, I listened to the Bible on tape as I went about my daily tasks and any time I got a chance. The difference was that I was so interested in it and I wanted to saturate my mind with it. No one told me to do that, I chose it for myself. 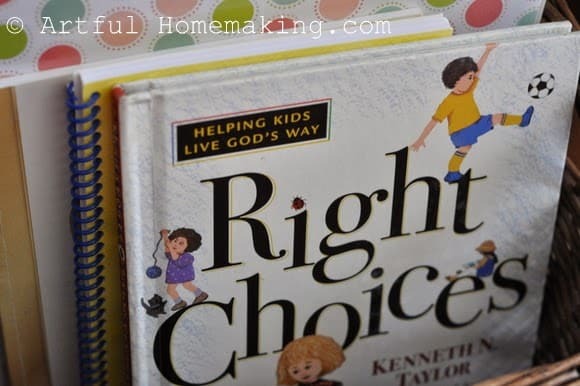 I think religious instruction is important for children in Christian homes. But that doesn't mean they are always going to appreciate it. Hopefully there will come a time (as in my own life) where they want to grow closer to God themselves, and they will crave the Word. But until then, I think it's beneficial to teach Bible verses. After becoming a Christian, I remembered the verses I had learned as a child, and they were a comfort to me. And even when I wasn't walking with the Lord, they helped me. So, I think keeping it short, positive, and cheerful is the best way to prevent them from hating Bible time. Make it personal. Share about what it means to you, how certain verses have been an encouragement in your own life. When I relate personal stories to my children, they really identify with that, and it helps them to see how helpful and relevant the Bible is to our modern daily lives. 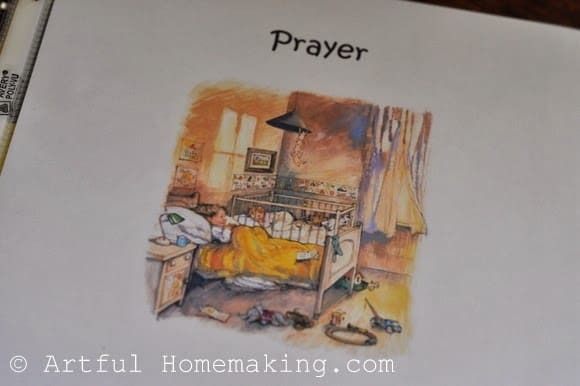 The graphics are from favorite children's book author, Shirley Hughes. We have quite a few of her books, and her illustrations are favorites! Just found this (and your blog) through Pinterest. This is so practical and helpful. I'm loving your blog! Welcome, Leigh Ann! Thank you so much for visiting and taking the time to leave a comment! Thank you! It seems to make the day start off right when we put our focus on the Lord first. I love this idea, Joy! It is one that I would love to use someday. What a wonderful, practical post! We used to have an official circle time when my children were younger and I miss it. As the children grew older, it changed, but you've inspired me to bring back something more structured. Thanks for sharing! Thanks so much for stopping by and leaving an encouraging comment! That sounds like a great idea, Lily! 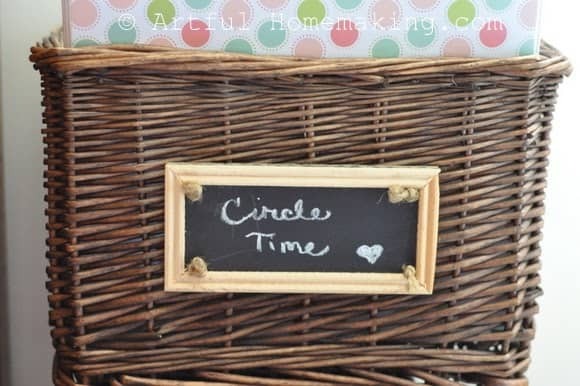 As a former public school PK/K teacher, I understood the meaning of "circle time" when I saw your post. However, what I didn't realize is I'm already doing it! We start our school days with all the children gathered around the table. We read one chapter from each testament of the Bible (we are reading straight through each one), a chapter of a book (a missionary story, etc. Right now we are reading the Children's Book of Virtues), memorizing a catechism, and saying what each one of us is thankful for.